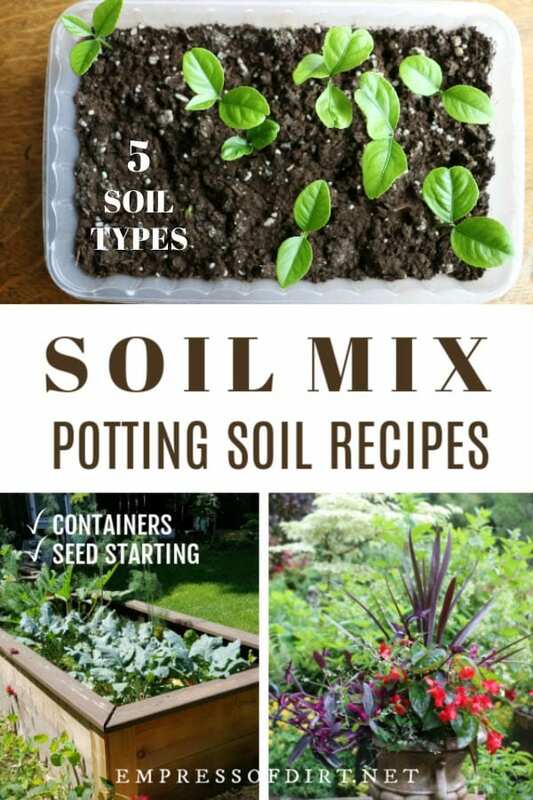 These soil mix recipes are from the new book, Urban Farming: Sustainable City Living in Your Backyard, in Your Community, and in the World (2nd Edition), by Thomas Fox. Find out how to make homemade growing medium for starting seeds, rooting cuttings, and growing potted plants. For sowing seeds, also see Seed Starting for Beginners: Sow Inside Grow Outside. 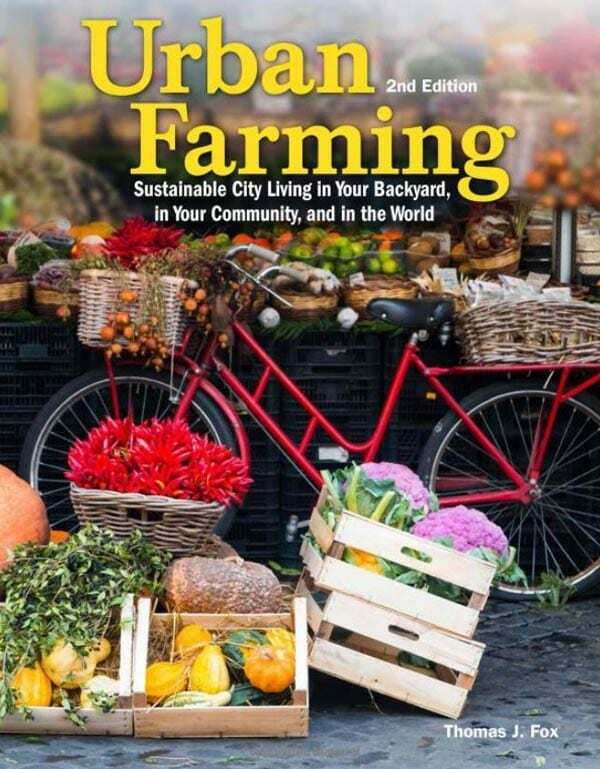 This excerpt from Urban Farming: Sustainable City Living in Your Backyard, in Your Community, and in the World (2nd Edition) by Thomas Fox, was provided by CompanionHouse Books, who also kindly provided a giveaway copy of this book. You can buy or make your own soil mixes for seed starting, growing cuttings and potted plants. 1 This explains the basics for understanding soil mixes and why you need them. 2 There is also information on soilless substrates used to adapt to unique growing environments. 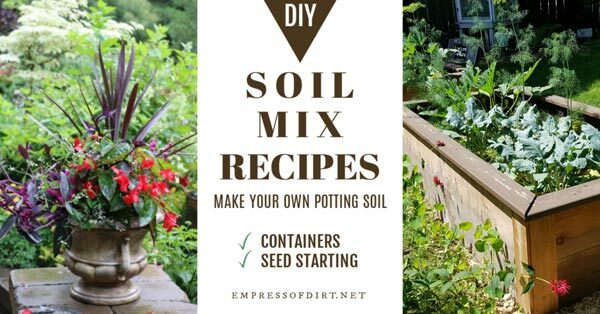 3 Click here to jump to the soil mix recipes. This comprehensive guide to urban agriculture will answer every up-and-coming urban farmer’s questions about how, what, where, and why. This second edition of Urban Farming walks city and suburban dwellers down the path of self-sustainability, with practical advice and inspiration from today’s urban farm movement. The easiest solution, especially if you’re planting small-scale, is to buy a commercial soil mix. Soil mixes are readily available, not too expensive, and well calibrated in their balance of water and air, nutrients and pH, and biotic and abiotic matter. Potting soil or potting mix is usually the way to go with container plantings. It tends to be light, well-drained, nutrient-rich, and composed of things such as sphagnum moss, perlite or vermiculite, and composted animal manure—frequently a “soilless” mix. Garden (or planting) soil (or mix) tends to be somewhat heavier but still well draining, high in biotic matter, and filled with nutrients. It is often made specific to certain kinds of plants (vegetables, citrus, ornamentals, and so on), and is meant to be mixed with existing topsoil. It’s probably the way to go with most raised beds. Commercial topsoil is generally the heaviest, cheapest, and least porous. Still, it may be better than your own topsoil. It is intended mainly for filling in depressions and improving your own soil. Another option is to buy commercial soil products and blend them yourself. Try to do this outside, away from wind, and with the ingredients lightly moistened first. Keeping a spray bottle at hand to dampen any dust is probably a good idea, as is wearing a mask and gloves. Most mixes contain something to retain moisture (peat moss, sphagnum moss, coir, or other biotic matter), something to increase porosity (perlite, vermiculite, or sand), and something nutritious (compost, leaf mold, or biotic/abiotic fertilizers). Lime is often added to naturally acidic peat mixes to balance the pH. You can use finer grades of vermiculite and sand in seed-starting mixes. There may be as many fans of soilless media as there are of soil. Some of the soilless options are organic (in the chemical sense, meaning that they contain carbon and used to be alive) and some are inorganic (may or may not contain carbon and are abiotic). Many packaged and prepared soilless media contain a blend. In fact, all three seed-starting mixes previously mentioned can be considered “soilless.” Two out of the three are sterile, and sterility is a common point in favor of soilless media, particularly when plants are at their most vulnerable. Yet soilless media are sometimes favored for the whole life cycle of the plant. At the United States’ Antarctic research facility at McMurdo Station, for example, perlite/vermiculite blends are used to grow vegetables and herbs, in part to avoid contaminating the pristine Antarctic environment with foreign soil microbes. McMurdo Station grows its food in the simplest kind of hydroponic set-up: the static solution method. Plugs holding the plants are immersed in a bucket of nutrient solution. The perlite and vermiculite give the plant roots something to grab onto and facilitate aeration. In fact, all of the nonnutritive abiotic soil amendments previously discussed are used as hydroponic substrates, as are some of the biotic ones (coir, for example). Some methods of hydroponics, such as the nutrient film technique (NFT), don’t even use substrate as we’d commonly think of it. In NFT arrangements, slightly angled channels made out of PVC pipe or other materials allow a constant shallow trickle of recirculating solution to reach the bare roots of plants, which are inserted into holes on the top of the channels. Aeroponics takes hydroponics a step further, maximizing root exposure to air as well as water and nutrients. It employs a high-pressure mist of nutrient solution to feed a plant’s bare roots. Aeroponics uses even less water than hydroponics, which is itself very water-efficient. NASA has experimented with aeroponics for space travel, and there are many aeroponic kits commercially available, from a $100 unit to grow herbs to entire turnkey aeroponic farms. Green roofs also usually employ soilless substrates. It’s a tricky situation. The substrate can’t hold too much water because of the load stress on the roof, yet it has to hold enough for plants while simultaneously letting air get to the roots. It also has to be light itself to avoid putting too much pressure on the roof, but not so light that it blows away. The green roof on Chicago’s City Hall, for example, weighs about half per cubic foot what topsoil does. Germany has been at the cutting edge of green-roof design for decades, and best practice calls for following the design guidelines of a German nonprofit, Forschungsgesellschaft Landschaftsentwicklung Landschaftsbau (The Landscape Research, Development, and Construction Society), known, for obvious reasons, as FLL. Extensive or intensive, single layer or multilayer, soil or bulk material, a green roof’s substrate is subject to exacting specifications by FLL. There are many proprietary substrate mixes for green roofs, often calibrated to the type of roof and location. They usually combine a lightweight aggregate material with organic matter. Gardening in North Carolina. I have four new raised beds that I want to plant with vegetablesand flowers. I plan to plant new vegies and this book sounds like it would be a great resource. New vegies I haven’t grown before. I’m going to grow, tomatoes,squash,onions,peppers,cucumbers, and I am going to plant 2 fig bushes I ordered the other day! Also going to seed out and plant several perennial flowers. Echinacea,foxglove,beebalm,yarrow,and butterfly weed, to name a few. I can’t wait to get my hands back in the dirt!!! Come on spring!